Jared Dort talks about working for 'fun'. 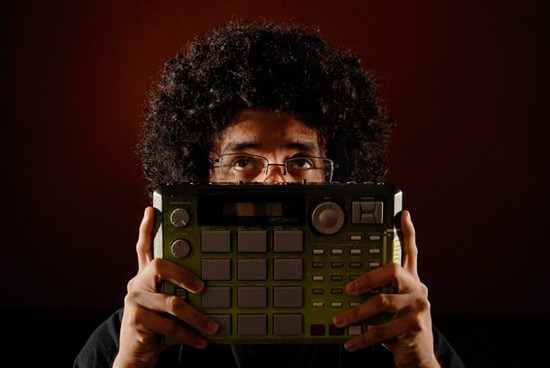 Daniel Rios, local producer and beat maker for Cerebral Arts, poses with MPC pad. It’s December again, an insane time for us photographers, our families and pretty much everyone else in the world. We’re all preparing for the holiday season in some fashion, and that generally means finding out what give, or what we’d like to get. I’ve been doing a lot of thinking before the month hit on what I want to do. Of course, like many of you this year, I don’t have a ton of money. In fact, like many of you again, I’ve seen a pay cut. This goes without saying, but 2009 was a tough year. That shouldn’t stop you from giving, or at least doing something nice for someone this season. There are ways to get creative, and since you’re probably a photographer, how about using your profession? Do you know of or are involved in a local charity that’s really making a difference? Go spend a few hours documenting what they’re doing and allow them to use "professional" photos for their website or newsletter. Who doesn’t need photos? Looking for a gift for your neighbor or relative? How about a nice family portrait? They make great gifts and are a way you can use your skill to your advantage. Not only do you cross someone off your gift-list, you get some practice in. You’ll come to find out friends will want to know who shot their awesome photos, too. Those are just a few ideas, but you get the picture. I decided to do something along those lines this year. For me, I wanted to help out a group of friends in Yuma who are just gaining some serious ground in the underground hip-hop community in Arizona and on the West Coast. The group is called Cerebral Arts. I gave them a few hours of studio time as way to potentially help further their careers. This was probably the most fun I’ve had on a shoot in quite a while. The diversity of the group lent itself to some great portraits that really displayed their personality. Working is a little more fun when you’re not "working". This accomplishes a few things. First, it gets some practice time in for myself. Time to try new lighting schemes for portraits and develop ideas for future work without dealing with deadlines and time constraints. Working at the Yuma Sun means I’m usually on the go, and more often than not, banging out assignments to get to the next one. Second, it's a gift, and like I said, who doesn't need photos? Cerebral Arts is more than just a rap group. They use their music as a ministry to reach out to young people in need with a positive Christian message and are involved in the community. Now I’m not using this space to get all religious, I'm just saying I chose this group to photograph because I felt they have a worthy cause which doesn't get a lot of attention in the local news circuits. This is just the start of something I'd like to do more of in the future. In Yuma we have a few organizations that I would love to get involved in, such as working with the mission and groups who help abused women and children. 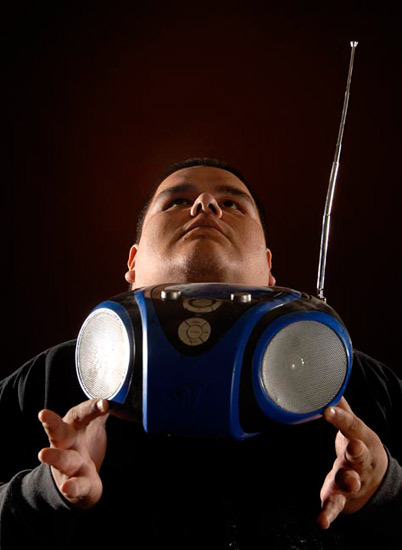 Fausto "Legal Alien" Lopez of the hip-hop group Cerebral Arts holds an old radio during a recent portrait session photographer Jared Dort shot to help out the group. I’m a photographer, not a plumber, auto mechanic or a social worker. This is what I can offer. Third, the photos we did provides the group and individuals with a professional look they can use for CDs, websites and press packets. It something they won't get from just anyone in town. Everything is tagged with my name, credited and searchable through PhotoShelter.com. Finally, so much of our business is word-of-mouth and networking-based that your reputation is just as important as your photographs. How many times have you gained extra business from a client who was directed to you? If you haven't, that's something to work on. Remember, working with any group is an open door that can potentially lead to something else in the future. I know this argument will come up so let’s address it now. It's the "free" word. Yes, I did it for free. The difference is really two-fold. One, I wasn’t asked. It was just something I wanted to do on my own time. Two, I maintain the copyright on the images, so if other media outlets intend to use them in the future, they have to deal with me directly based on our royalty free agreement, although I did allow the group tremendous lead-way in photo usage. I’m not advocating working for free to get your work seen, I’m simply saying use your photography as a gift on occasion. There are creative ways to run and expand a business, and now, more than ever, we need to find out what those are. Using the web, SEO, and blogging are all great tools, but don’t forget that relationships are also important. I hope everyone here in SS.com land has a great holiday season with their families and friends. Here’s to a successful 2010 and another great year of SportsShooter.com. AUTHOR’S NOTE: I received emails from some SS.com members recently wondering what I’ve been up too and why I hadn’t been writing for the newsletter in a few months. Back in August I checked into the hospital after dealing with a severe case of sinus infection that kept lingering. The doctors did a series of tests and caught something more important. I had an enlarged heart and that it was beating too fast and was also diagnosed with Graves Disease – in simple terms an overactive thyroid. I missed about a month of work total while recovering, and, until recently, have just been getting back on track. I am feeling much better In fact, this is the best I’ve felt in a year. Life could have been a lot worse if I didn’t go to the hospital. I say this just to encourage everyone to get check-ups on a regular basis from your family doctor.